What's the oldest restaurant you've been to? 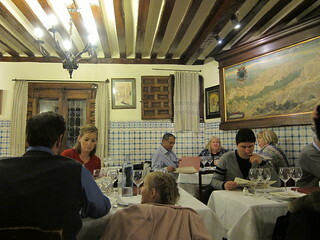 Well, unless you've been to Restaurante Botin (also known as Casa Botin), then you still have ways to go. Casa Botin in Madrid goes back to 1725, when it was operating as an inn and restaurant, and the space is reminiscent of what it was. Tight spaces and narrow wooden stairs took us to the upper dining area. On the walls were menus from special dinners dating to the 1800s for the royalties and visiting government officials. 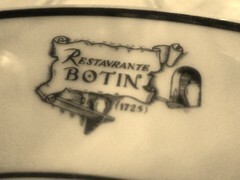 A visit to Casa Botin isn't just about visiting the oldest restaurant in the world - the food is actually quite good. For the most part they still serve simple fares. 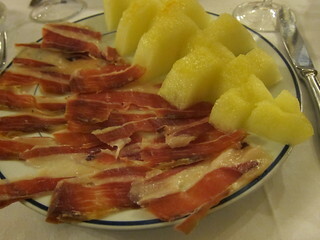 Appetizers include salads, soups, and jamon iberico or a plate of ham with melon. The rest of the menu is divided into egg dishes, vegetables, fish, and meats. They list two specialties on the menu, so naturally we had to get those. 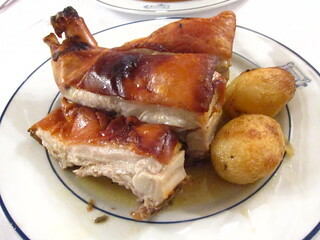 The two specialties are the roast suckling pig and roast baby lamb, both roasted slowly in a wood-fired oven. 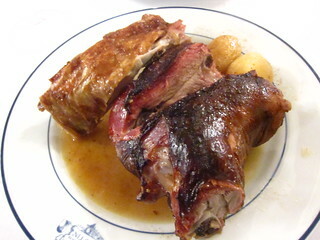 No frou-frou here, just a plate of meat, juicy and tender, with crispy skin (especially on the suckling pig!) served with a couple of potatoes. Both excellent! The dessert menu was surprisingly pretty big. We were stuffed from all the meat so we went with the lighter, fruity desserts. 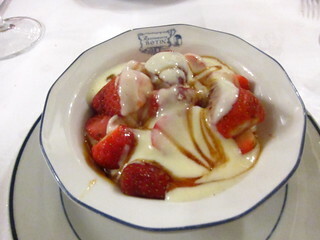 The lightest was perhaps the San Isidro Strawberries, served with slices of apples and cream. 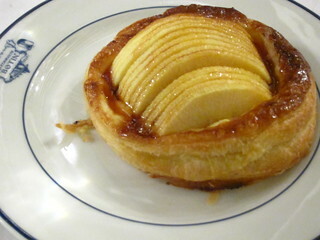 The hot apple tartlet had a nice flaky crust. I absolutely would go to the oldest restaurant in the world, how neat! Glad to hear they can cook too! Great post!